Hope you enjoy looking at this screen. You'll be seeing it alot. Almost as soon as it appeared in shelves, Hitman was widely criticized for its long levels and lack of an in game save system. Although Eidos Interactive claimed there were several possible ways to finish each level, giving the game unparalleled freedom, many a frustrated gamer quickly realized that this was a lie. Although there are a few nuggets of interest in the game, they are covered in a greasy sauce of frustration and regret. Hitman at its best combines stealth with cool assassin weapons to secretly take out your target and calmly walk away. Several weapons, such as the fiber wire and sniper rifle in a briefcase help give the game atmosphere. Sometimes you even get to do sneaky stuff like putting poison in someone's soup or trapping them in a sauna and turning up the heat. The Hotel level in the game is a great example how levels in Hitman should have been designed. You walk in, smooth talk your way past the guard, and complete your hit. If your cover is blown as you leave, you run to your limo out in front and speed away as the guards fire behind you. Sadly, there are only one or two of these levels, and they are towards the end of the game. At its worst, Hitman is a crappy shooter, using assault rifles against hoards of enemies with little regard for silent kills. There are several of these firefights, and you must complete them to get to the good levels. Although not a contract killer myself, I can't imagine its a good idea to walk into a heavily guarded military base and use a minigun to try and blow away everyone in sight. The game is also very unforgiving when it comes to having your cover blown (as will inevitably happen at least once a game). This in itself isnt necessarily a bad thing in a game. After all, you wouldnt expect a guard not to raise an alarm when he notices his dead buddy in a corner. However, in a game that virtually demands perfection from the player, there are several noticeable lapses in reality that make your task just a little bit harder. 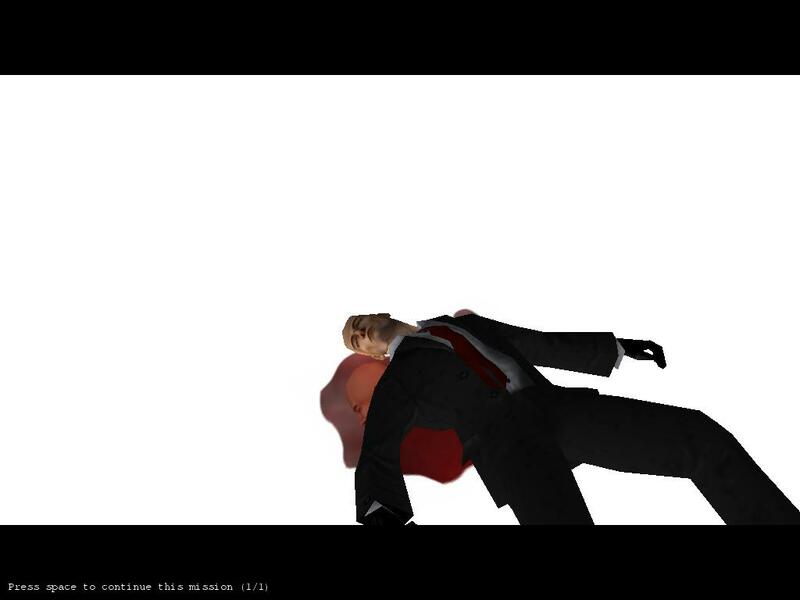 For example, for a professional hitman your character sure is a bad shot. When zooming in on the sniper rifle, his aim will sway up and down. The professional killer can't steady himself long enough to shoot one bullet? Another, rather amusing, example comes when Hitman takes someone's clothing and dresses up in them. Come on, are you telling me a Chinese Triad gang isn't going to wonder where the white bald guy wearing their uniform came from? Perhaps they are an equal opportunity employer. Although there is quite a bit to do in each level, there is no real overarching plot to speak of. The cut scenes were apparently shot in the bottom of a well, since the echo is so bad you cannot tell what the shadowy figures are saying. A couple of letters you can read are sprinkled throughout the game, although the messages are ambiguous at best. A lengthy diatribe by a mad scientist tries to provide a back-story, but is given to at the worst possible time. Perhaps fearing gamers might figure out how trite the plot is, the designers give you this information while you are fighting a lengthy battle with your clones. It's probably best you don't know the plot, since the game begins with amnesia and ends with Hitman discovering the bad guy is his father. The designers were probably going to add in a dream sequence to make sure they had used every cliché known to man, but wanted to save the space to make the levels even longer. The worst aspect of Hitman by far is the lack on an in game save system. Eidos defended the decision by saying that saving within a level makes games too easy. Perhaps this is true, but in reality this wasn't their call to make. The programmers forgot that they are designing a game for the mass market, not themselves. The reports from their beta testers should have revealed this. In a game so uniformly criticized for having one flaw in particular, one would think that they would have picked up on this from their testers earlier. Since gamers must complete the level in one sitting, you must set aside a large chunk of your day to beat a level. The combination of difficult levels and no ability to save makes the game an exercise in futility. This means Hitman committed the worst possible sin for a game; it is not fun to play. Gamers are a forgiving bunch; we will overlook quite a bit in the pursuit of fun (just look at Halo). But if the game is not fun, then there is no point in wasting your time playing it.